Walking through Tokyo’s garish Roppongi district on my first visit to Japan, I found it remarkably easy to ignore the pulsing high-tech signs promoting electronics, movies, and cars. What caught my eye was probably the most modest ad: a tiny bilingual sandwich board that said “Craft Beer Bar.” When I think of Japanese alcohol, sake and mass-produced lagers come to mind. Apart from the excellent Hitachino Nest, I wasn’t aware of any Japanese craft brewers of note. 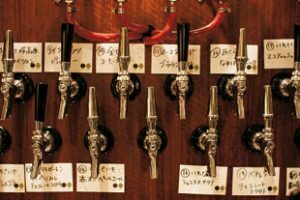 Skeptical, I squeezed down a narrow staircase into a tiny, subterranean bar, expecting nothing more than insight into which foreign craft beers suit the Japanese palate, and possibly a taste of a Hitachino Nest creation that hadn’t yet crossed the Pacific. I got neither. Instead, I found 19 gleaming taps ingeniously squeezed into the diminutive space, with every last one offering a local brew. That bar (it’s called Ant ‘n’ Bee, in case you’d like to visit) and those beers represent just a fraction of what’s available. Japan’s craft beer is little known globally, but alarmingly good. Breweries you’ve never heard of and may struggle to pronounce are making well-executed beers in a wide array of styles. I sampled a white beer from Shiroyama, cloudy with citrus and a hint of spice, subtle enough to please Belgian witbier partisans. Those who like muscular hop flavor would probably enjoy the powerful IPA I tried from Minami Shinshu. But beyond high-quality renderings of popular Belgian, German, and American styles, many breweries are experimenting with Japanese flavors, like ginger, yuzu, or even fist-sized Uramura oysters.